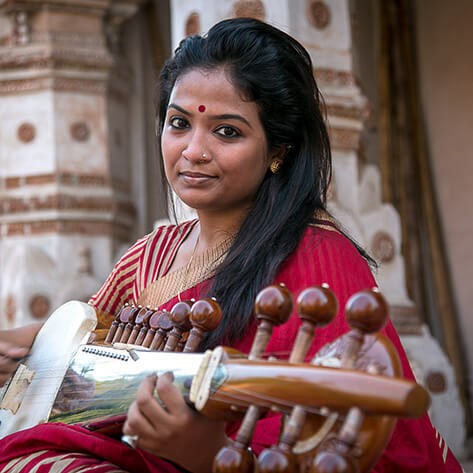 A promising musician of her generation, Debasmita was introduced to musicat the age of 5 by her father and first Gurusarod player Pandit Debasish Bhattacharya.For the last twelve years she has been receiving training fromthe Padma VibhushanPandit Buddhadev Dasgupta of the SeniaSahajahanpur Gharana. Debasmita is currently pursuing herPh.D. from Rabindra Bharat University. Debasmita regularly conducts workshops, demonstrations and concerts inschools and colleges across India, organised by the SPICMACAY.She has performed extensively across India and the world. Some of her performances include,ITC Sangeet Sammelan-Kolkata, Sangeet Sankalp -Ahmedabad, ChayanautUchanga Sangeet Sammelan – Bangladesh, Sangeet Utsad – Agartala, Kalaprakash– Varanasiand many more.She was conferred with the title Sangeet Praveen by the Pracheen Kala Kendra Chandigarh in 2008. On an invitation from ETHNO Sweden,Debasmita visited that country in 2015 to collaborate along with hundred other world musicians. She has also delivered several classical music solo concerts in Florida, Nashvilleand San Francisco. Debasmita continues tocollaboratewith the musicians from different corners of the world.